So you’ve decided to start a blog with the hopes of turning it into some extra side hustle income, or even turn it into your main source of income. Well, if you plan on making money from your blog, it’s time to start treating your blog like a small business. But when it’s time to start designing the website for your blog, it’s important to understand how your design and layout support your goals as a blogger. It’s also important to know how a small business website differs from a blog. See, there are specific features that most blog designs have. Most times those differ from the design of a small business website that just so happens to have a blog section. It can be confusing to understand the difference between the two. 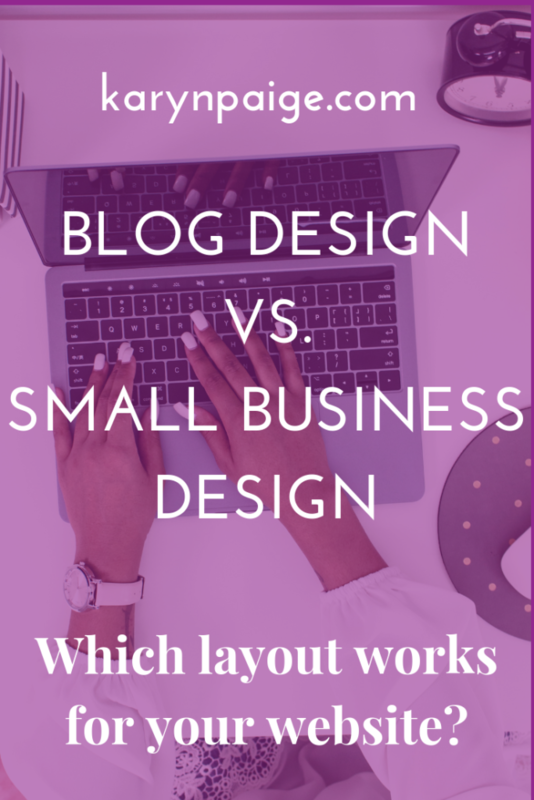 For the purpose of this article,, I’m going to explain how the design for a blogger’s website differs from the design for a small business owner’s website. A successful money-making blog relies on website traffic and page views, but a small business website doesn’t. A small business site relies on selling products and services. Blog Site: The whole point of blogging is to get lots of visitors to read lots of blog posts. Keep those readers clicking on your internal links to related posts. The more website traffic you have, the more opportunities you’ll have to generate revenue from affiliate marketing, ad revenue and sponsored posts. Small Business Site: The whole point of a small business website is to sell your products and services to your ideal client. If you run an online business, you’re definitely going to care about bringing traffic to your website, but you don’t have to rely only on website traffic to generate income. Instead, your services and products generate the bulk of your income. What they have in common: Both types of websites need people to actually visit them so you can get your name and brand out there. No visitors? No opportunities to make money. One of the biggest differences between a blog’s website design and a small business’s website design is the homepage layout. Blog Site: Your blog’s homepage should be chock full of blog posts for visitors to read. Make your posts obvious to find. Including several blog posts on your homepage gives your visitors a better idea of what kinds of content to expect from you. It also helps keep visitors on your page longer, while they’re scrolling through your page and browsing your content. This helps you analyze how well your blog posts are performing. You can also include a right sidebar on your homepage, which is not a standard feature on a small business website. Here’s a post on how to use your blog sidebar as a marketing tool. Small Business Website: Your website’s homepage should act a mini sales page. It can be used as the first step that your visitors take to enter your sales funnel. It should introduce your business to your visitors so they know what you offer. You might want to invite your visitors to learn more about your services by including a button that leads to your services page or a link to book a free consultation with you. Here’s a list of my suggestions for the features every small business website should include on their homepage. What they have in common: Both types of websites can benefit from using email marketing to reach out directly to people who want to get more value from you. Make sure you have an email opt-in form on your homepage so visitors can sign up for a freebie in exchange for their email address. Your website’s main menu, or navigation bar, also differs depending on if your website is for a blog or a small business. If you start selling custom merchandise, you would definitely want to add a Shop tab to your menu. Small Business Site: Your main menu can be pretty straight forward. The three typical pages (home, about, contact) would apply to you. Make sure you include a menu tab that leads to your services (consider calling it “Work With Me”) or shop. What they have in common: If you decide to generate affiliate income by recommending products and services to your visitors, you could include a Resources tab to your menu. A subtle difference between a blog website and a small business website is how photos and images are used. Blogs tend to use way more images than the average small business website. Blog Site: Each blog post usually includes a featured image. It’s eye-catching and it helps illustrate the topic of the blog post. When you have a gallery of blog posts displayed on a page (like your homepage, for example), all of a sudden you have a really cool visual grid to entice visitors to stay on your page. This all ties back to your metrics and analytics. You want readers to stay on a page for a long time, not just view multiple pages. Using photos and other images on your blog creates a little hack that makes people keep reading and scrolling on your pages. Think of the last time you read a blog post for how to cook a certain food dish. I can guarantee that post included photos of every single step in the process of making that dish. Well, those photos aren’t just for educational purposes. They also keep you looking at the page for a long period of time. Small Business Site: You don’t need as many photos on your site compared to a blog site. 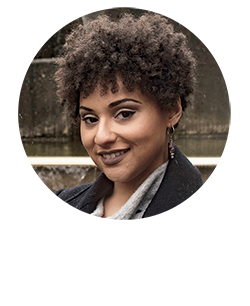 At the very least, you should have a photo of yourself or your team, and graphics or images that help break up large blocks of text. It varies from business model to business model, but you don’t have to rely on images as much as a blog does. What they have in common: Including images on your website helps break up your text and illustrate your main points. Using images will also improve your SEO (search engine optimization). You can use alt-text to optimize your images with relevant keywords. Many bloggers want to generate income from placing ads on their site. Small businesses don’t rely on this website feature as much, because their revenue comes from making sales and booking clients. Blog Site: You have to consider how including ad space will affect your layout. Typically, ads will end up looking like other photos on your pages. However, you can’t always control the ad designs or the size of the ads. They may end up pulling focus from your content. You could even increase your bounce rate if your visitors feel like they are being bombarded with ads and then just leave your site altogether. Small Business Site: If you are an affiliate member for any services you use to run your business, you might consider adding a few ad banners to your sidebar or a Resources page. Otherwise, I’d suggest steering clear of using ads on your site, because they will pull focus from the products services you provide. Whether you’re a blogger who’s in it for the money or for the love, you want to make sure that your users are having a cohesive and rewarding experience when they use your site. Once you have a clear understanding of that, you’ll be able to create a design for your website that makes sense and meets your marketing goals. Whether you’re a blogger or a small business, your website needs a few essential elements to attract your target audience. 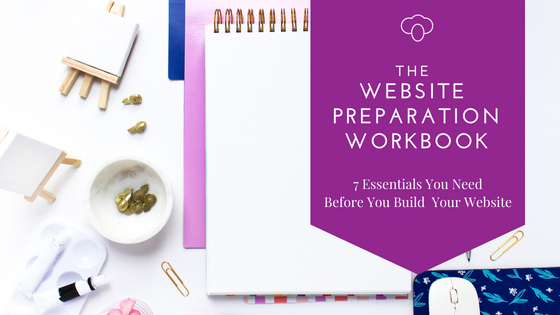 Sign up below for The Website Preparation Workbook and I’ll show you exactly what you need to get started.